MiobiO, the domestic appliance for organic cultivation, permits home cultivation thanks to the use of an automated system that guarantees irrigation, ventilation and illumination. The advantage of MiobiO is its natural simplicity, allowing you to grow any kind of plant in total freedom; thanks to the presence of four container trays into which you put your top soil or where you can place your pots. The independence and removability of each tray offers you a high degree of modulation of your cultivation spaces, so you your plants can grow as if in nature! Through the use of digital controls you are able to easily set and control the ideal moisture level for the soil, as well as the exposure time of the plants in artificial light in order to guarantee the necessary automatic conditions for your plants’ sustenance, also in your absence. MiobiO can be placed anywhere; either standing alone or in-built inside a kitchen unit or inside a piece of furniture in any room. 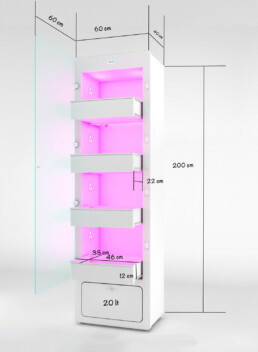 The MiobiO installation needs only an electric connection (for home use) and a back wall to secure it in place. Thanks to the system of sub-irrigation (also used in the Hanging Gardens of Babylon!) water consumption is restricted; and this system guarantees MiobiO’s functioning for around a month with only 20 litres of water. MiobiO water provision is leak-free. It is brought to the base of each tray in a limited quantity and avoids evaporation and allows each plant to independently absorb their own nutrients. Electric consumption is 80W, like a fridge or even a traditional light bulb seeing as this system functions at a low voltage similar to the system for a smart phone. In order to respect the environment and optimise consumption, MiobiO, with its ventilation system of the surrounding air, uses the temperature of your home. Thus your plants need the same ambiant temperature that we also enjoy! MiobiO is hygenic, natural and clean! The top soil is contained in removeable trays, excess irrigated water is salvaged for later use and the presence of a frontal glass door prevents the area around it getting dirtied with earth and other organic debris. MiobiO is also equipped with an automated ventilation system that permits constant air circulation. It spreads natural fragrances throughout your home, purifying the air that you breathe and helping you relax with all the benefits of aromatherapy. The typical pink colour of the illumination is a spectrum of light needed by plants and flowers for photosynthesis and stimulation of the chlorophyll. This light has been studied to take care of your plants for all of their vegetative cycle. The photobiological certification guarantees its safety and the phototherapeutic atmosphere creates complete relaxation. The safety of MiobiO is guaranteed. It is completely in accordance with the current building and safety norms and has been certified by trials and tests declaring it to conform to EU regulations.